KUALA LUMPUR, February 18, 2014 – OPPO Electronics Corp, an international manufacturer of smartphones is making its debut in Malaysia with the launch of its flagship Android handset, the OPPO N1. OPPO is a globally registered technology brand that has carved a significant presence in North America and Asia. Having entered the mobile market in 2008, OPPO Electronics now boasts a network of offices in several countries including Thailand, Indonesia, Vietnam, India and Mexico. The company also has an office in the United States, where it markets its blu-ray range of products. “Malaysia is an exciting market for us. The people here are technology savvy and are constantly looking for compelling designs and advanced capabilities for their mobile applications. We believe OPPO is the right match as our main focus is meeting our customers‟ needs. We are a young and innovative company that develops devices to give each user a unique experience without sacrificing simplicity. What makes us different is that from the very beginning, we vowed never to become a regular brand,” said William Fang, OPPO Electronics Chief Executive Officer. On the OPPO N1, he said more than 1,500 engineers were involved in the research and development process to create the cutting-edge smartphone. The company‟s engineers produced 200 patent applications every month for technology innovations, placing OPPO among the 10 most productive companies in terms of technology innovations. “Typically, we would require a research period of 9-12 months to manufacture a smartphone but for the N1 we invested 18 months in R&D. We manufactured some parts of the phone in-house, and the units underwent several tests including temperature, humidity, and weather conditions before they were ready for the shelves,” explained Product Manager, Haifeng Wang. OPPO N1, the star of the N series features a 5.9-inch 1080p display, Snapdragon 600, 2GB of RAM, 16GB of storage, and the signature swivelling 13MP camera. The biggest highlight of the OPPO N1 is its camera, which can rotate up to 206 degrees and can lock at any angle. “The key is customers no longer have to choose between tak ing a selfie with a lower quality front camera or with the higher quality back camera but shooting blind. Now, all we need to do is just swivel it around and get the shot we want with the same camera”, beamed Brand Manager, Lu Chen. The O-touch panel on the backside of the N1 can switch on the picture mode without touching the screen, and take pictures with it.. It also offers a keychain-friendly O-Click remote that caters for off-device operation and control, including remote camera operation. It connects wirelessly to the smartphone via Bluetooth, and it is set on an alarm sound connection on the phone and O-Click to help locate a misplaced N1 or O-Click. The N1 is priced at RM1798. The OPPO N1 also has the distinction of being the first to come with Color OS, and it has over 400 unique design improvements and 37 unique patents in the OS for highly improved usability and artistic look. The Color OS‟ unique features allow customers to draw on the screen with one finger, turn on the phone, camera, or any other applications easily. The Color OS can be activated with a simple touch of a finger and it can recognize gestures. Simultaneously, the company is also introducing the Find 5 Mini, the R1 and the OPPO Neo. All three phones have distinct features and benefits targeted at different customer segments. The OPPO Find 5 Mini comes with a 4.7-inch screen with a 960 x 540p resolution, 1.3GHz quad-core processor, 1GB RAM and 4GB ROM. It has a 2000mAh battery packed inside a 7.75mm thick body. The phone features an 8 mega-pixel f/2.0 rear camera, along with a 2 mega-pixel front. 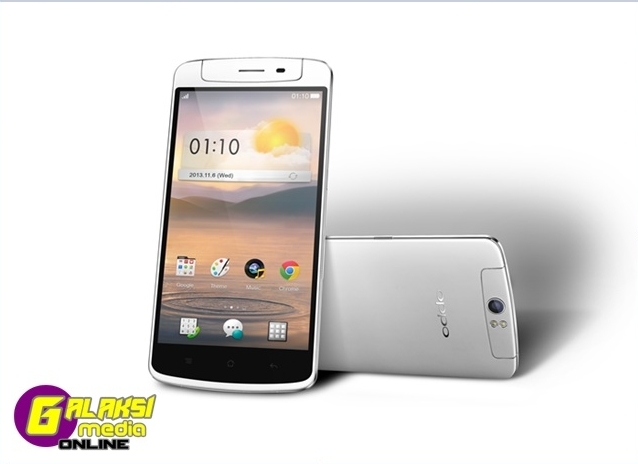 The device gets OPPO‟s take on Android, i.e., Color OS which is based on Android v4.2 Jelly Bean. With admirable specifications, the OPPO R1 offers a 5-inch IPS display boasting a resolution of 1280 x 720 pixels with a 1.3GHz quad-core processor and 1GB of RAM. The handset is 142.7 x 70.4 x 7.1mm in size and weighs only 140 grams. The Oppo R1 also has an 8MP camera on the rear with f2.0 aperture as well as a 5MP front-facing camera for video calls. 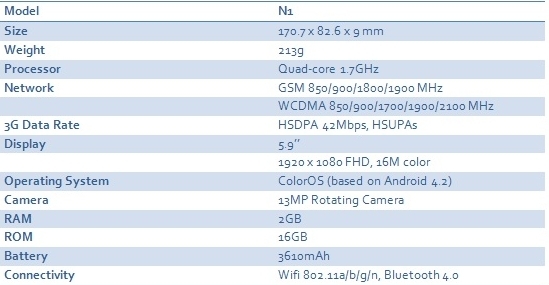 Other key OPPO R1 specifications include 16GB internal storage, WiFi, Bluetooth, TD-SCDMA/GSM, Android 2.2 Jelly Bean. Targeted at the low-end market, the OPPO Neo has a 4.5 inch screen size with IPS display 854 x 480 pixel resolution. It is powered by dual-core 1.3GHz processor and sports with 512MB of RAM. The phone is coupled with 5 megapixel rear camera and 2 megapixel front facing camera, and runs on Android 4.2 Jelly Bean with Color OS user interface and a Quick reach gesture to operate the phone. OPPO Neo also has dual-SIM dual standby and has 1,900 mAh battery capacity in 132 x 65.8 x 9.2mm body dimension, and weighs in at 130g. With the launch of four mobile phones, William Fang said that OPPO, which means ‘friend’ or ‘companion’ hopes to become good friends with the over 42 million mobile subscribers in Malaysia, who make-up 143% of the mobile penetration rate in the country.